The Institute of Supply Management (ISM) has now released the January Non-Manufacturing Purchasing Managers' Index (PMI), also known as the ISM Services PMI. The headline Composite Index is at 56.7 percent, down 1.3 from a revised 58.0 last month. Tuesday's number came in below the Investing.com forecast of 57.2 percent. 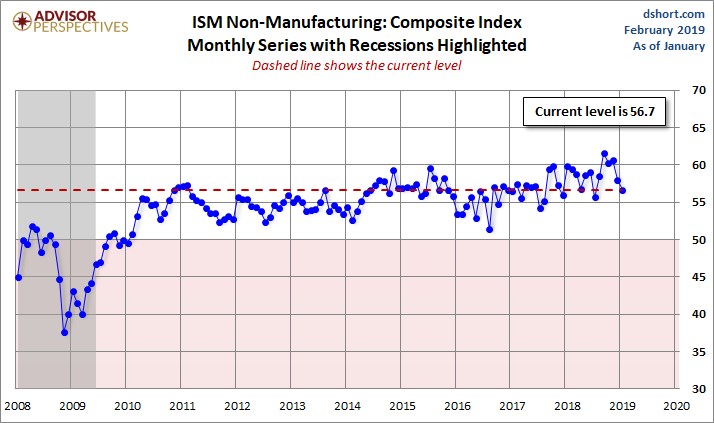 The more interesting and useful subcomponent is the Non-Manufacturing Business Activity Index. The latest data point at 59.7 percent is down 1.5 from a seasonally adjusted 61.2 the previous month.